We try to offer low min. order qty. and affordable pricing on all of our custom decals. If you need low qty. or something special like a different print process or smaller qty. to complete your job. Send us an eamil and we'll work with you to try to get it done. 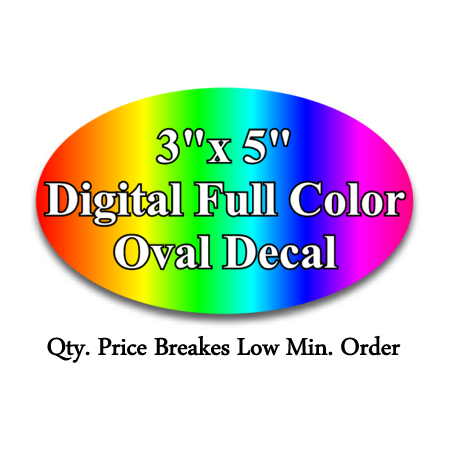 Minimum quantity for "3"x 5" Custom Oval Decal Digital 4 CP" is 25. Custom full color (4-color process) printing with glossy clear lamintion. Make for a great looking High Quality decal that's ready for your message! Use our online design tool to create your decals or you can upload a high quality jpg. file that is the exact size for this decal and at least 300 dpi. We'll print anything you want. 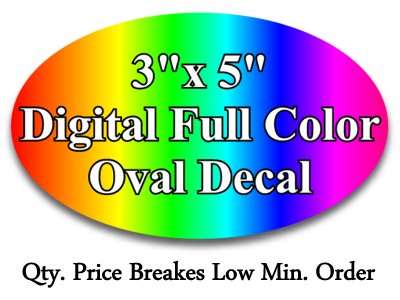 Oval decals have many uses, our customers most popular designs are used for Clubs, Promotional for business, politics, packaging and unique design for resale.